Replacement Theology| Israel's Festal Calendar- Shadow or Reality? Replacement Theology– True or False? Our previous article explored the doctrine of replacement theology from the perspective of Israel and her entire existence being a shadow of better things to come. There can be no serious question about whether Israel’s existence was typological, a foreshadowing of “better things to come.In fact, I suggest that a study of Israel’s festal calendar proves beyond any doubt that God had – from the very beginning of Israel’s history – intended to replace the shadow with the reality. The shadow was Israel; the reality was / is, Christ and his body! Colossians 2:13-17 – “And you, being dead in your trespasses and the uncircumcision of your flesh, He has made alive together with Him, having forgiven you all trespasses, having wiped out the handwriting of requirements that was against us, which was contrary to us. And He has taken it out of the way, having nailed it to the cross. Having disarmed principalities and powers, He made a public spectacle of them, triumphing over them in it. So let no one judge you in food or in drink, or regarding a festival or a new moon or sabbaths, which are a shadow of things to come, but the substance is of Christ. Notice that when Paul wrote this epistle, in the early 60s AD, that he said Israel’s festal calendar, the entire cultus, was still “a shadow of good things about to come (from the Greek word mello, in the infinitive).” Now, if Israel’s festal calendar – which was eschatological to the core – was a foreshadowing of the realities of Christ that was to come, and if those realities were not a restoration of Old Covenant nationalistic Israel, then we have here the purest form of replacement theology! The shadows were intended by God, from the very outset of Israel’s history, to be replaced with that to which they pointed – Christ and his body! 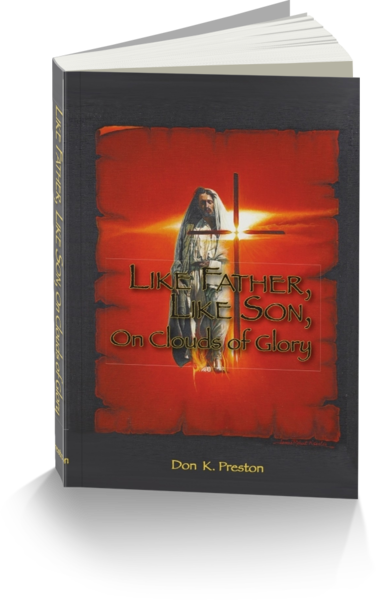 Be sure to get a copy of my book, Like Father Like Son, On Clouds of Glory, in which I adduce a wealth of information, from scripture, proving that Israel and virtually everything about her, was always considered by the Lord to be a mere shadow of the better things to come. This book contains a great study of Israel and her world as a shadow of the better things of Christ. Let me make a point here that is very important. Dispensationalists freely admit that the first four of Israel’s feast days were fulfilled in the events of Christ’s Passion through Pentecost. (All one has to do is Google Israel’s Feast Days” and you will find a wealth of information. See the following site that posits the fulfillment of the first four of those feast days). This admission is fatal to Dispensationalism, because it means that Pentecost, the last of Israel’s first four feasts, pointed to the events of the day of Pentecost of Acts 2. But, catch the power of this, Pentecost was the establishment of the church! Now, as we have seen, the Dispensationalists admit that Pentecost was the fulfillment of Psalms 110– the ascension of Christ to the right hand of the Father. But, this means that the ascension and Pentecost was foretold in the OT promises to Israel- falsifying the claim that the church was not predicted in the OT. Add to this the fact that Dispensationalists admit that Pentecost fulfilled Israel’s festal calendar, and this truly is fatal to Dispensationalism. Israel’s festal calendar foreshadowed / typified the reality of the coming first fruit of the kingdom. So, if the day of Pentecost in Acts 2 was the fulfillment of that feast day, then this is prima facie proof that Israel’s types and shadows foreshadowed the establishment of the church– and the church as the fulfilled replacement – of those literalistic, physical festal events! Are Christians today to keep the first four of those physical feast days? While there are some Messianic Jews who keep those days, the majority of evangelicals do not do so, believing that since those feast days were fulfilled, Christ himself is the “replacement” of those things! Of course, Paul rejected the idea that those festal observances were to continue to be kept by the followers of Jesus. We rejoice in him, not in carnal feast day observance! This then, is replacement theology in the purest form. But, we want to emphasize again that this is not a “bad news” thing. To be sure, the passing of the cultus was painful with the destruction of the magnificent Jerusalem Temple, but, here is something that is mostly overlooked. As Jesus foretold that coming destruction, he said “This gospel of the kingdom will be preached into all the world, as a witness to the nations, then comes the end.” Do you catch that? The “Good News” of Replacement Theology? Jesus called the message of the impending destruction of Jerusalem and that Temple “this gospel of the kingdom.” How in the name of reason could Jesus call that horrific coming catastrophe the “good news” i.e. the gospel, and then, how could he call it “this gospel, good news, of the kingdom”? How is the destruction of the Old Covenant city and Temple related to the kingdom? Well, stay tuned, and I will show how this “gospel of the kingdom” is in fact not only related to our study of replacement theology, but, absolutely necessary! For now, just carefully consider what we have seen in this installment. The fulfillment of Israel’s festal calendar was intended– inherently intended- to be the replacement of that system! This is the purest form of replacement theology, because it is not a doctrine of failure, it is a doctrine of fulfillment!